Once an aquarium has been chosen, set-up, and started, the aquarists’ next Job is to maintain it. 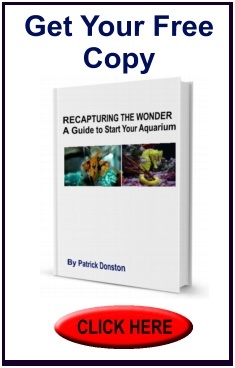 The scope of this paper is to briefly outline what a new aquarist might want to know when buying his/ her first fish- Most problems arise because the beginner just didn’t know any better- Getting off to the right start is important and will save you time, money, and headaches. I find that when people are warned about the possible problems that may arise, they are less likely to make mistakes, and become a better hobbyist. Cycling (also known as conditioning) is the establishment of nitrifying bacteria in a closed aquatic system. After fish are added to a new aquarium, the water chemistry gradually changes as a result of the excretion of fish wastes and the presence of uneaten food scraps. A new system will pass through a period characterized by elevated levels of ammonia and nitrites. Both are toxic to fish. They will burn fish’s eyes, skin or fins and even cause death if present in high levels. These products are broken down biologically into a relatively harmless substance (nitrate). This is known as the nitrogen cycle. Filtration based on a continuous nitrogen cycle is referred to as biological filtration. Biology means life, In other words, we need living bacteria to remove these harmful toxins out of water. Like germs, we can’t see bacteria, it grows in the filter and on the gravel, Aerobic-bacteria is not there when an aquarium is first set-up and only will start to grow after the fish are put in and expel ammonia. This period is variable and can only be determined by periodic water testing. Because a new tank does not have any established bacteria, it should not be stocked quickly with rather sizable populations. Stock tanks modestly, giving time to allow biological action to convert ammonia to nitrite and nitrite to a less toxic nitrate molecule. Overstocking a new tank leads to many problems such as cloudy water, sick fish, and death. The chart in figure 2 will show how the toxins rise above the fish’s tolerance level when the aquarium is newly overloaded. The trick is to put enough fish in your tank to produce ammonia but not too much as so the ammonia rides up past the threshold. Below I’ve listed the recommended numbers of fish to start a new tank. Most fish are hardy enough to ride the nitrogen cycle through conditioning. My experience suggests various species of tetras, danios, gouramis, barbs, common goldfish and cichlids are the least susceptible to ammonia/nitrite poisoning. Although slightly more susceptible, live-bearing fish such as swordtails, mollys and platys are still good to start with. Although there is no question that some varieties of fish are less susceptible to ammonia/nitrite intoxication, there still remains many fish not suitable to start an aquarium. Below I’ve listed common fish I DO NOT suggest starting with because of sensitivity to ammonia burn or eating complications. Neon tetras, rummynose tetras, cardinal tetras, guppies, bettas, silver hatchets, tricolor sharks, monos, archers, and baby angelfish. All knives, elephant nose, puffers, eels, ropefish, polypterus, snakeheads, all loaches and botias. Catfish, plecos, otocinclus, algae eaters, crabs, lobsters, colombian sharks, corydoras, botias. loaches. Of course there are many more fish not suitable that are not included in this list. If you wonder about a favorite fish, just ask a reputable dealer, they’ll be able to guide you properly. Fishes not appropriate for cycling new tanks are best suited to add after the cycling period has ended (when nitrites have fallen to zero). A decision of what type of fish to put into your aquarium is purely a matter of preference; However, you should be aware that some fish are incompatible with each other or living plants. Different fishes also thrive in different water conditions. Some fish species may prefer hard water with an elevated pH, while others may flourish in soft water and a lower pH. One should always consult an aquarium specialist before adding starter fish so fishes or plants you might want later will be compatible. New fish should be fed once a day carefully, so as not to overfeed and allow food to accumulate in the gravel bed. Excess food will spoil causing ammonia and nitrite to exceed the threshold. For most fish, a dry staple diet (flakes) is best to start off with. Flakes soften quickly without disintegrating in water, thus they are especially suitable for aquarium use. Cichlids and marine fish should also start with a dry food because they produce up to 50% less waste than being fed frozen or live foods. The temperature of tropical fish tanks can range from 76*F to 84*F but the optimal temperature should be 78*F. Heaters are used to keep the temperature stable. If you don’t have one I highly suggest you purchase one as ick and other diseases are prevented by keeping the temperature stable. When judging heater size, you should buy a heater 4 to 5 watts per gallon of aquarium water. Lights should only be turned on for 6 to 12 hours a day. Fish do not have eyelids and need complete darkness to sleep. You should look at your aquarium as a tiny part of the world in your home. The sun comes up and the sun goes down. Generally, the longer the lights are on, the more algae grows. Algae is a good thing. It gives off oxygen for the fish to breathe and provides food for fish to graze on. Algae will start to grow the day after you put water in your tank. You probably won’t notice it until the second or third week. It will look like green or brown patches growing on the glass, decorations, or gravel. The longer the lights are on the faster algae grows. Conversely, if the lights are on a short time algae grows slowly. Natural sunlight can also cause algae problems. It is wise to keep aquariums away from windows or well-lit rooms. The best way to control algae is to control the light in your aquarium. After the tank completes the cycle (conditioning), you can purchase an algae eating fish to help keep the algae down. Remember, the only thing really wrong with a lot of algae is aesthetics. In other words, if you don’t mind it, it’s OK.
A new aquarist should start to check their water for ammonia and nitrite within the first few weeks. Very high levels of either may kill fish in a short period of time by decreasing the oxygen-carrying capacity of blood, neural and osmoregulation function. As long as your fish seem to be eating and behaving normal, there is no need to worry about the nitrogen curve. If a fish dies, or looks sick to you, DO NOT MEDICATE, as it will prolong the cycle. Instead, one should bring their water in to have it checked for ammonia and nitrite. You should also have it checked before buying your next set of fish or replacing any lost fish. Look at the cycle as a boat ride, whoever gets on at the beginning, must ride it to the end, No one can get on once the ship has left and anyone who falls off (dies) can’t be replaced until the ship finishes its journey. Prior to the addition of fish or after adding your first fish, one can condition the aquarium by seeding it with bacteria. Ask your salesperson to purchase a culture if you want the cycle time to speed up. A culture can not only accelerate the cycle by a few weeks, it will reduce stress on the starter fish. There are a number of liquid enzymes on the market to help speed up the cycle. Although minimal, they do work (but not as well as a culture). I have found through my experience, a culture works much more efficiently than a liquid bacteria supplement. Please ask an aquarium specialist about what type of culture would be best suited for your situation. In conclusion, I have noted some major points a new aquarist might want to know when starting up an aquarium. Below I have summarized some of the important facts of this paper. If you have any questions concerning any topics of this discussion, please ask an aquarium specialist. I’m sure they can clear up any confusion. I hope your journey into the world of fish is an enjoyable one. The number one cause of death in new aquariums is ammonia and nitrite, not disease. Do not overstock a new tank. Wait until the cycle has ended (approximately 4 to 6 weeks) before adding your second set of fish. We only know the cycle has ended when nitrites have been tested and they are zero. Not all fishes are appropriate to start with; consult before buying your first fish. Always acclimate new fish to any aquarium. Temperature should be 78 ° F for all tropical fish. Feed new fish only once a day, overfeeding can result in ammonia/nitrite levels to exceed threshold. Leave lights on tank about 8 to 10 hours a day.